The Kerela cops attacked an Opposition protester waving a black flag at the Chief Minister of the state,to such an extent that he had to be hospitalized. One of the cops was seen attacking the protester’s private parts even as his other policemen held him tight. The brutal police action has received criticisms even from the Congressmen. It’s sad to know that politicians are using the police force, which is to protect the people, on the layman…Nice doodle..
thanks Karan for liking the theme and the doodle .. indeed this was brutal and uncalled for ..
Aajkaal toh facebook pe blag flag post karne pe police mar sakti hain !! 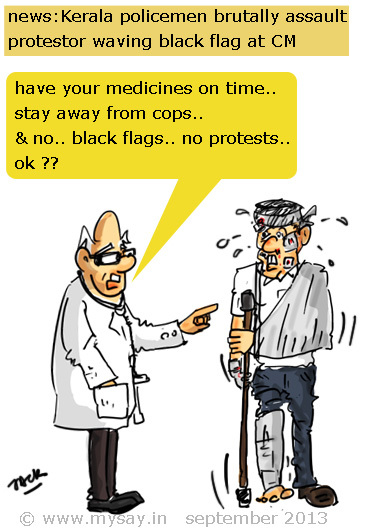 Bande mein himmat hain… Khuli sadak pe black flag !! power is responsibility .. who will explain this in India .. to the ones who get power.. they all behave kings ! What is with the police? Shocking! How long do they want to silence the public? This incident was brutal and shocking. There are always rotten eggs in the police force, believing in the old school groomed during the Emergency. Such people have to be severely punished. The CM seems to have given the police a free reign in several things. hei Manu Sir.. I am too confused about the themes .. I mean the free ones .. 😀 somehow wanted to change the old stuff.. It was brutal and seemed like the cop was taking out some personal grudge 🙁 Such inhuman acts if not treated strictly promote rebel .. !! !